As many of you have been following, Dolly has not quite been herself. As an older girl who was perpetually broody in her glory days, she has slowed down to a quiet, non-broody, little hen who naps most of her days in little patches of found sunshine. Her little Silkie Bantam body is old but still enjoys the thrill of scratching in the dirt for the morning’s scattered treats.Over these past few weeks, Dolly seems to have improved. She is now returning to the coop to sleep at night instead of trying to stay in the run. She no longer jumps up on the roosts to sleep. The effort is too much and I don’t believe she can physically do it. Instead, she tucks herself into a floor level nesting box or into a pine shaving filled corner of the coop. A couple of days ago, she was walking funny. I took a peek at her feet. 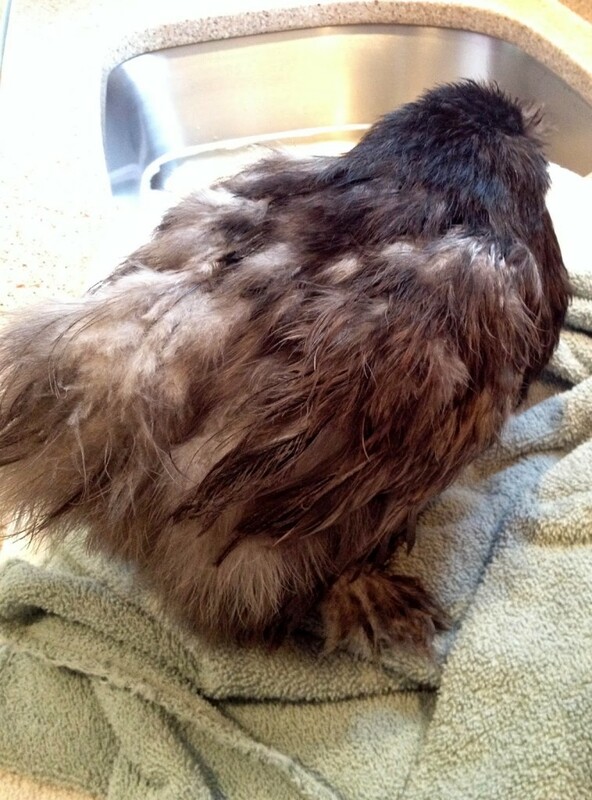 In the freezing temps, fresh chicken poo that she stepped in had frozen to her thickly feathered feet. She also had a good amount of frozen poo on her bum, probably from not sleeping on a roost. Early this past Sunday morning, I scooped her up and decided she needed a bit of TLC. 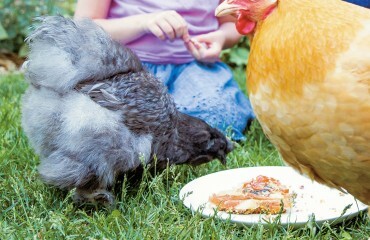 Typically I do not bathe my chickens in the winter. I wait until the earth thaws, the days warm, and I can attend to them in the garage in a warm basin of soapy water and the drying rays of the sunshine. 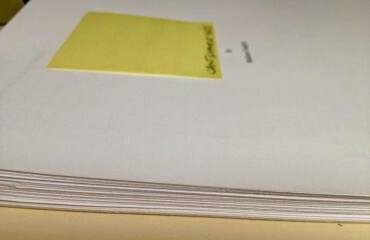 This time it clearly could not wait. I laid out some old towels on the kitchen counter and the kids retrieved the blow dryer. I filled the sink with a bit of puppy shampoo and warm water. In went Dolly. I could instantly feel her relax. 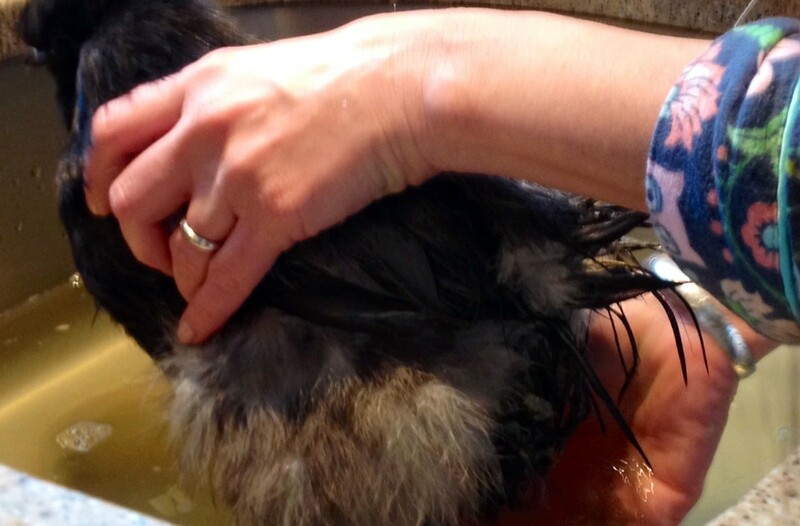 Most of the hard frozen poo would need to be worked at gently, between my fingers slowly coaxed from her feathers. She spent 20 minutes in the sink as I worked diligently. She didn’t try to fly out. She didn’t flap her wings. Dolly is smart and today, like she usually does, knew that I was there to help her. After a good rinse from the faucet, I scooped her little body up and placed her on the towel. I gently dried her off. She began to chat little coos to me and the kids. She was so sweet. With the blow dryer on low and warm, we began drying her bum. 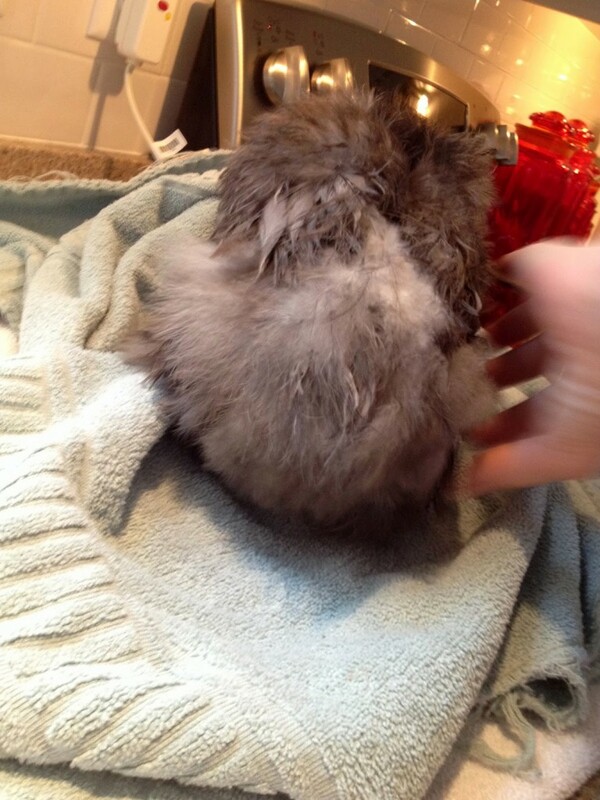 Slowly the wet, matted, feathers began to return to their glory. Glorious sweet Silkie feathers in whites, blues, lavenders and grays began to fluff. Dolly closed her eyes. We lifted up her wings, dried under them, dried her belly and snuggled her. She fell asleep. I swear I could feel my heart smile. Once completely dry, I returned the hen saddle to her back. 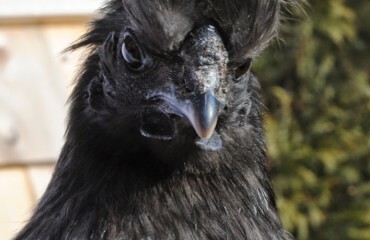 The feathers that were pecked out by Ginny were just beginning to return and I did not want to tempt the others with fresh pin feathers out of their natural curiosity.I placed Dolly back outside in the coop to gather her bearings. Then I tossed some mealworms into the run. Out of the coop ran Dolly to join the others to scratch and peck at the dried crispy goodies in the run. 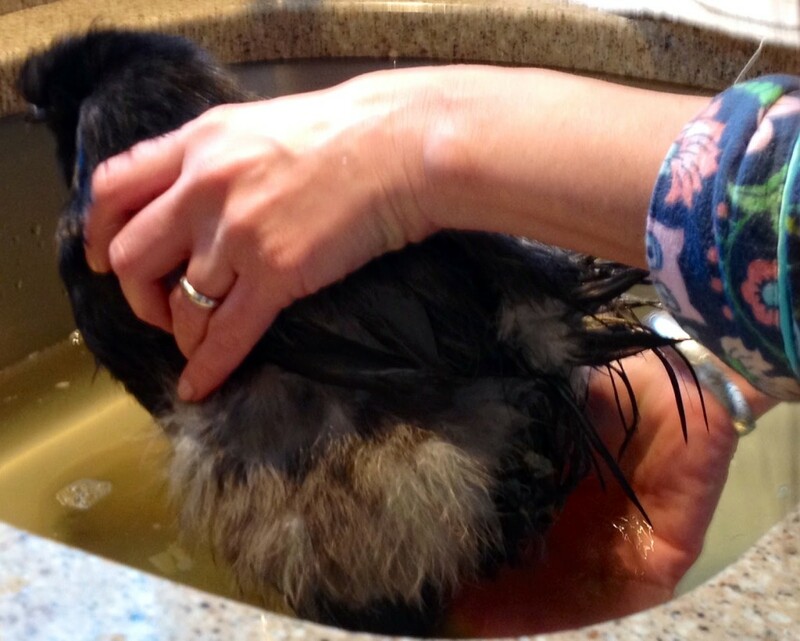 Just like that her spa zen-state and she was ready to return to life as a chicken.